I don’t think I have ever seen a blog post that started by saying that the pattern had been created using the Lutterloh System. And yet the system is quite widely publicised and demonstrated. So when Inkberrow Design Centre in Redditch announced that Jenni Taylor (of Sewing Bee fame, as they say) was running an introductory course, I cleared the snow off the car, and headed a short distance south. Jenni assists Sue, whilst I took up the rest of the studio! How to shorten a long story? The system was invented in Germany and has been around since 1935. The principle has been around for even longer, using the so-called Golden Rule that all bodies are broadly in proportion to themselves. 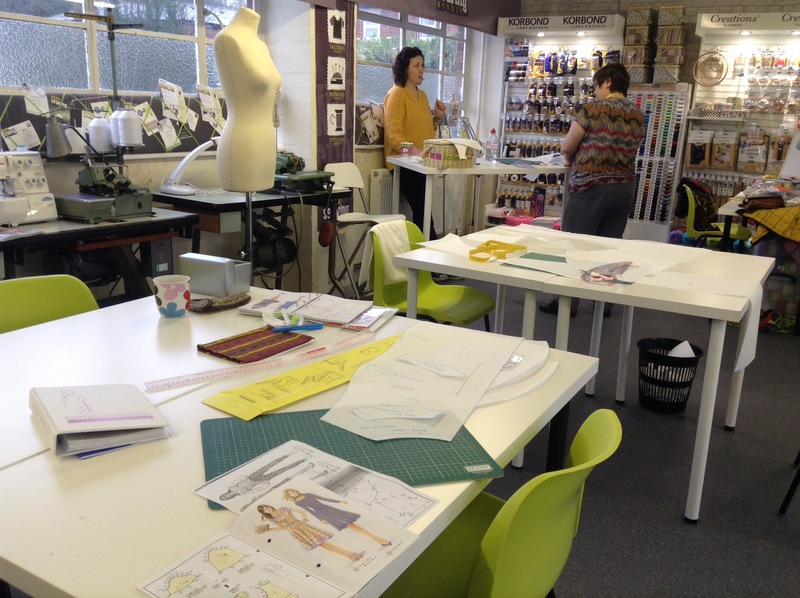 Using only two measurements, the bust and the hip, it’s possible to create any pattern using a special ruler and a mini version of the pattern. My objective was simply to test it out, using the system to make a toile. My bust and hips are not far off in proportion, but my waist is out of proportion, so I was keen to complete a toile that would test the theory on my body shape. It is surprisingly easy to use. Jenni offered a few pieces of advice, notably the need to check the positioning of your mini pattern in relation to your pattern paper by testing the longest measurement in any direction. It would be, and was in one corner, possible to ‘ fall off’ your paper when measuring out the design. The system comes with a pattern book of 280 patterns, which are updated quarterly, and you can subscribe to get updates every quarter. The core of the system is the special tape measure and the mini patterns. 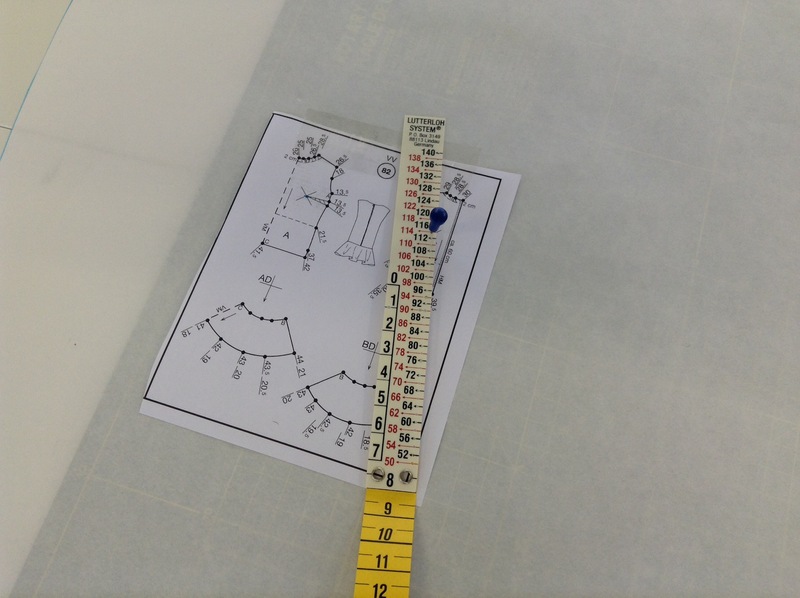 You can purchase the system with two quite large curves, and with rolls of paper, which is somewhat thicker than normal dressmakers tracing paper, and probably better to use to draw the patterns. I deliberately chose a pattern that tested the theory of the proportionate bust and hips, and that I was likely to complete within the day’s course timetable. Which, as you can see, I did! I’m pleased that I did the course because there are many tips to be learned to make using the system easier. It was said that many people buy the system, but don’t fully understand how to use it, and subsequently don’t, which makes it an expensive white elephant. The base system is over £100, and if you buy the paper and plastic curves it’s nearer £200. I wouldn’t recommend it for beginners. 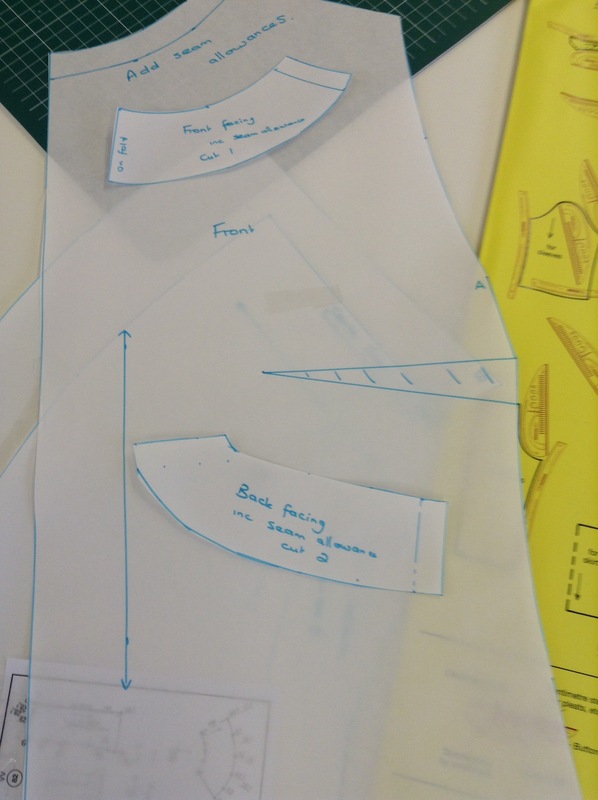 The patterns come with no cutting layout and you have to apply generalised construction methods and work out for yourself what order to do them. But if you enjoy working it out for yourself, then there are hours of fun with the system! A few quick tips: photocopy the mini pattern, write your two measurements on the photocopy, use a cutting board under the paper to anchor the pin, tape your mini pattern to your paper, check your markings before removing the pin, add seam allowances, and basically generate as many of the normal pattern markings as you can…. I’ve been thinking about how the system works. The special tape measure is basically a tool for pattern grading with incremental measurements to key points of the design. To me, the clever part of the point where the pin is centred. Its actually the same point for all pattern pieces; somewhere near the middle of the tummy, and the centre of the Da Vinci drawing that spawned the product. Will I make the dress that I toiled? Well, probably yes. It seems a pity to have put in all that effort and not got anything wearable from it. Will I buy the system? Not sure. I have a box full of patterns, and I am regularly tempted by patterns from other sources. It was fun using the system though, and I can see some potential for mixing and matching the pieces to get unique garments. It would also be a useful tool if it’s necessary to make up patterns in a range of different sizes. There is actually an entire blog devoted to learning the Lutterloh System. It is called COME SEW LUTTERLOH WITH ME. HI Ann. Thanks for letting me know. You might be interested in my latest post where I make up the dress using the Lutterloh pattern. This entry was posted on February 13, 2017 by ann hebden in Dresses, Fashion, Handmade, Inkberrow Design Centre, lutterloh, Sewing and tagged Dress, Handmade, Inkberrow Design Centre, Jennifer Taylor, lutterloh, Sewing, Toile.